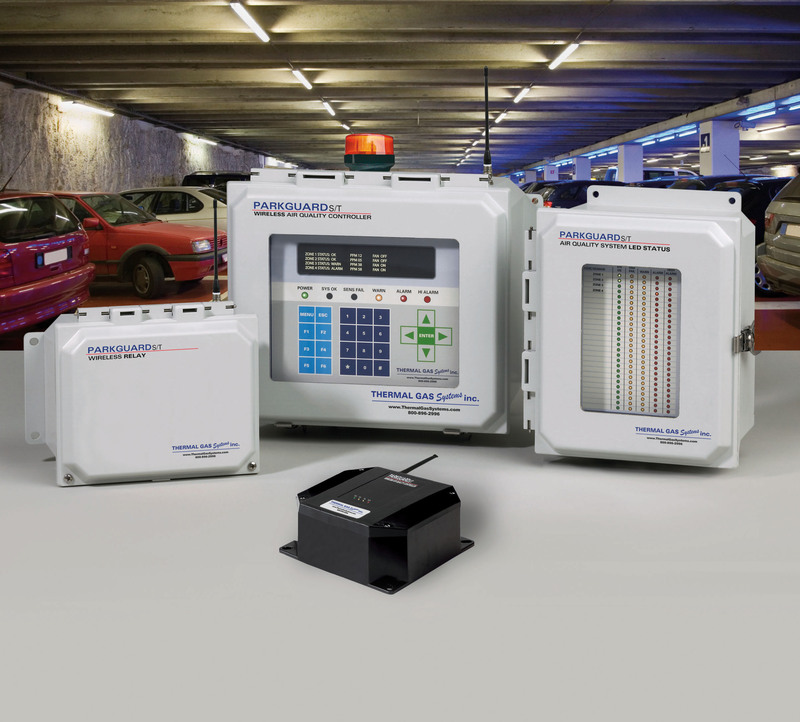 Roswell, GA – 19 January 09 – Thermal Gas Systems introduces Parkguard S/T Wireless system for sensing carbon monoxide (CO) gas and controlling facility ventilation systems. The Parkguard Wireless S/T system includes a Controller with additional CO Sensor/Transmitter, Wireless Relay, and Remote LED System Display modules. The Parkguard system is capable of receiving wireless input from up to 256 electrochemical type carbon monoxide, oxygen depletion, or nitrogen dioxide sensors, configurable in up to 32 zones. 3-wire analog and 4-wire RS-485 digital bus inputs are also included. Wireless remote relay modules can be located alongside the fans and dampers to be controlled, eliminating extensive power and/or signal wiring runs from the centrally located controller. A controller-based system like Parkguard also offers substantial energy-saving and maintenance benefits by activating ventilation systems only when a target level of CO gas is detected. An extensive system report functionality enables building managers to track and record historical activity and alarm events. Information such as gas type, sensor range, initial calibration data, and required calibration frequency are combined with last calibration dates and results to produce detailed reports on sensor function, future calibration dates as well as sensor replacement information. Parkguard is designed for single or multi-level, enclosed, vehicular structures including; any structure or facility with the potential for carbon monoxide gas buildup such as parking garages, truck loading docks, vehicle maintenance facilities, airplane hangers, tunnels, and warehouses. Thermal Gas Systems will be exhibiting at AHR Expo America, January 26 – 28, 2009, booth 3742. Customers may contact Thermal Gas Systems by calling 770-667-3865. Based in the greater Atlanta, Georgia area Thermal gas Systems is a manufacturer of industrial leak detection and control instruments. Founded in 1988, the company built a solid reputation for designing and manufacturing refrigerant gas leak detection monitors typically used in facility mechanical system rooms.